Here you’ll find step-by-step instructions to assist you in putting your kitchen together, as well as some additional tips and tricks, direct from our kitchen experts. Use a spirit level to check the walls. Mark any uneven spots or holes. When you mount the wall cabinets, you might need a packer to fill the gap so that the cabinet and wall line up straight. Wood or Masonite pieces make ideal packers. If you have walls opposite each other, measure the distance between them at multiple points. This will give you clear information that the walls are parallel. 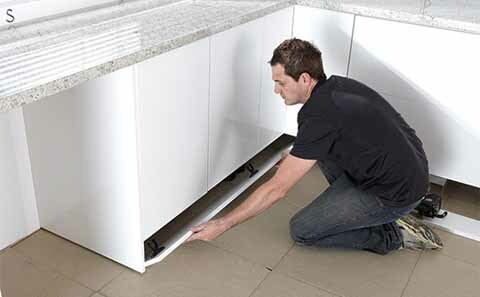 Again using your spirit level, check the parts of the floor where you plan on installing the base cabinets. 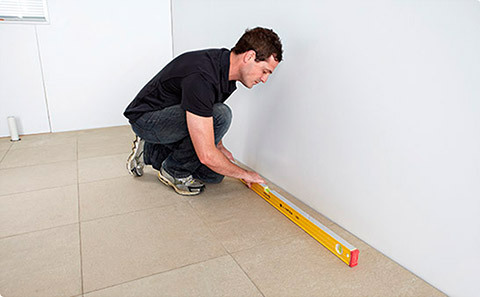 Make a mark on the wall with a pen or pencil, indicating the highest and lowest sections of the floor. Refer to your kitchen plan and measure the position of your cabinets. Mark their location with pen or pencil. This will help you see how everything fits together. Earlier you would have marked the highest point of the kitchen floor (Part One: Step Three). Now mark the wall from that point at 870mm. Draw a level line from this new point to where you’ll be putting in your base cabinets. This line will be used to set the heights of the cabinets. If your kitchen has a corner then this is where you should start. Position the cabinet and adjust the legs until the cabinet matches up with the line you marked out in Step One. Check the position with a spirit level. 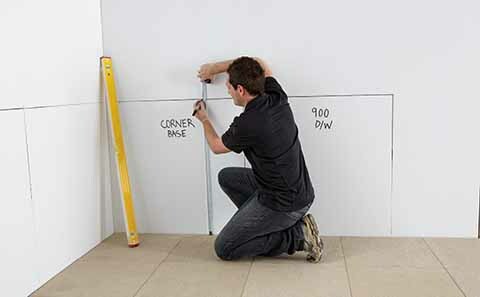 If you have plaster walls, measure out from the corner to the wall studs and mark where they line up onto the base cabinet. You’ll notice that the ends of the corner cabinet extend past the back panel. We’ve done this so that if your walls are not square, you can plane the end panels to ensure the front of the cabinet is square. If planing isn’t required, there will be an insignificant gap between the wall and the cabinet. If there’s no corner cabinet in your kitchen design, then start with an end cabinet, making sure to fix the end panel or filler to it first (This is covered in Part Four). Using a small drill bit (2-3mm) drill pilot holes into the cabinet at the points you have marked that line up with the wall studs. Make sure you use the correct fittings and screws for your wall type. It may be that you need to use a wall plug system to join the cabinets to the walls, these can be purchased at your local store. Position the cabinet back into the corner, keeping it level. Using the supplied 60mm screws fix the cabinet into the wall studs. Two screws should be enough to hold each cabinet in place (4 for a corner cabinet). Check with spirit level and adjust if you need to before continuing. As before, mark, drill, line-up the cabinet, and fix with screws. Temporarily fasten the cabinets together with clamps. Use the small drill bit to make two pilot holes in the inside of the cabinet, top and bottom as shown in the image. 30mm screws (supplied) can then be used to join the two cabinets together. 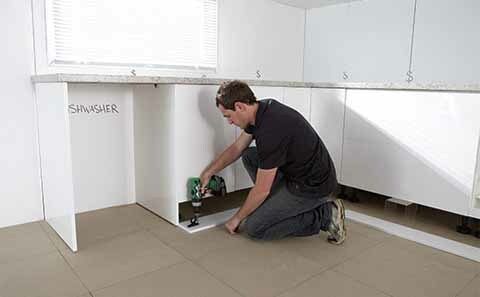 The base cabinet that will contain the kitchen sink should be prepared prior to installing. Holes for water pipes and drain can be sawn in either the cabinet base or back panel. There are two methods to do this; you can either use a hole-saw drill bit, or you can use a jigsaw. 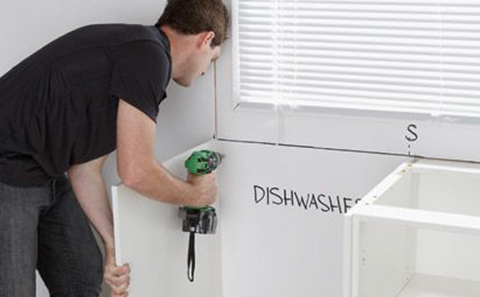 If you’re installing a dishwasher, make sure to leave enough space not just for the dishwasher but also the end panels, which are 18mm each. See Part Four for more advice on this procedure. And that’s it for the base cabinet installation. Start by affixing a timber strip to the wall, as in the picture. The piece of timber needs to be about 18x90mm. This is going to give you an accurate guide for positioning and fixing the cabinets, and will make it easier to hold them in place. using your spirit level to guide you, draw a straight line from this mark where you will be positioning the wall cabinets. This marking stands for the bottom edge of your wall cabinets, and is the place to put the top of your timber strip. This height will also ensure your wall cabinets align with any pantries used. Now fix the strip to the wall, using your spirit level to ensure it’s level with the marker. If you have plaster walls, be sure to fix it to the studs you’ve already marked out. Keep this in mind when setting the kitchen height: Australian regulations state that the distance between the bottom of your rangehood and the top of your cooktop must be 650mm. equivalent measurements on your assembled wall cabinet. Then, using a 2-3mm drill bit, make pilot holes at the marker points aligned with the wall studs. Easy to follow, step-by-step assembly instructions are included in each pack. Assemble the cabinets following these instructions – once again read the instructions through before you start. Remember if you get stuck at any point we recommend you call your local store for advice. Position the cabinet on top of the timber strip. Then, using the supplied 60mm screws, fix the cabinet into place. In most cases, two screws per cabinet should be enough (4 for a corner cabinet). Check the cabinet’s placement with the spirit level and if you need to, make any adjustments. You will need wall end panels either side. also remember the cabinet is shorter and should align with the other wall cabinets at the top. 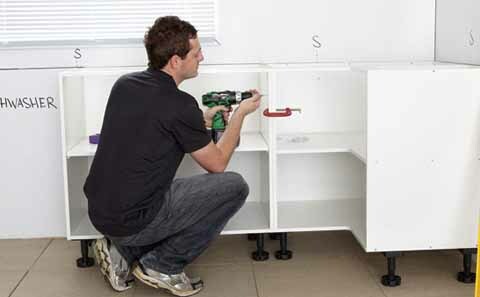 Now you have a process to follow: mark, drill, line-up the cabinet, and fix with screws. Temporarily fasten the cabinets together with clamps. Then, using a 2-3mm drill bit, drill two pilot holes from the inside of the cabinet out (one top and one at the bottom). Use the 30mm screw supplied to join the two cabinets together. 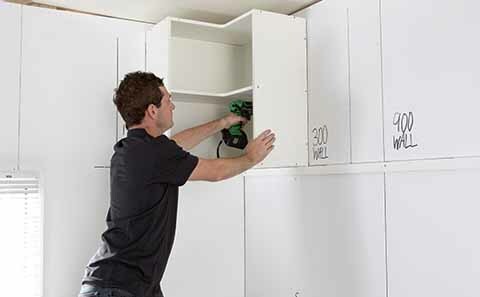 Repeat the process until you’ve installed all the cabinets, making sure to align each cabinet with the last one. In the packs included with each cabinet, you should find the hinge mounting plates. All you need to do with these is to press them into the pre-drilled holes, then tighten the screws. Take down the timber strip, and that’s it. You should be looking at a set of correctly aligned and secured kitchen wall cabinets. method. If everything is level, skip ahead to Step Two. 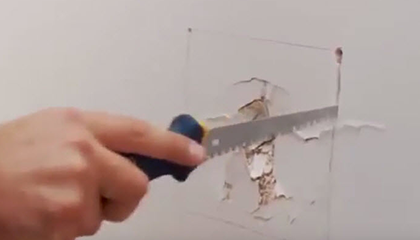 If you have uneven walls then you’ll need to make a template to cut to. You’ll need a tape measure, compass, pencil and thick cardboard for template material. Cut the cardboard to the same height of the cabinet. Position it to the place where the filler panel is needed. Place the compass against the wall. Keep the compass horizontal and level, and follow the line of the wall, tracing the shape of the wall onto the cardboard. Measure the distance from the farthest point of the wall to the cabinet and mark it. Cut the template along each pencilled line, ensure that it fits, then trace the shape of the cardboard onto the filler panel. 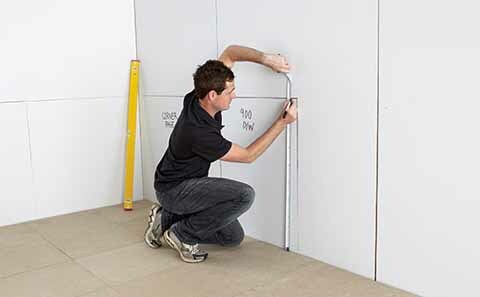 If the walls are level, simply measure the distance from the wall to the back of the cabinet, mark this distance on the top and bottom of the filler panel, then draw a line between the two marks. You should use a fine-tooth handsaw or jigsaw for this task, following the recommended method. Cut along the marked line with the face side of the panel up. Place the filler panel into the space with the cut edge against the wall. 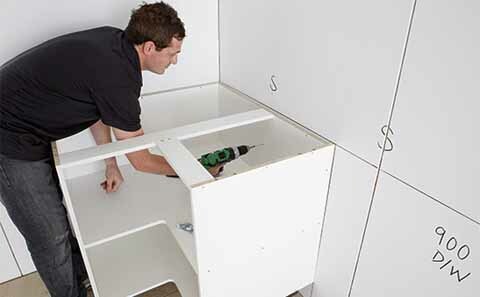 Make sure the panel stays securely in place while you attach it to the cabinet. 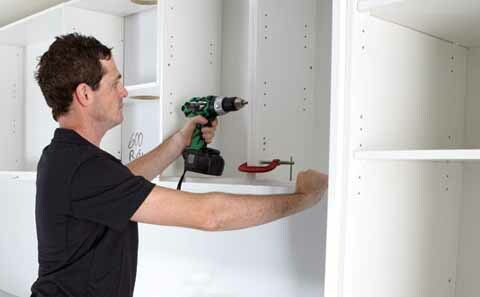 After pre-drilling holes, attach the panel with screws from the inside of the cabinet. Repeat the process with any other filler panels you need to install. Don’t forget to remove the protective film. Sealing the gap between the wall and filler panel is a good idea. You’ll need a good quality brand of silicon sealant and a caulking gun. Before you begin, tape alongside the area to be sealed. 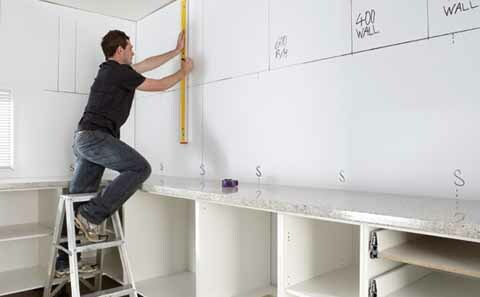 If you’ve bought benchtops and are cutting them to fit your kitchen then start by measuring and marking the benchtops, based on your kitchen cabinet measurements. If space permits, you can choose to leave your benchtops with a slight over-hang, or line them flush with the end panels. Use a guide (such as a piece of timber), firmly clamped in place, to ensure a straight cut. For best result, use a jigsaw with a blade designed to cut laminate surfaces. 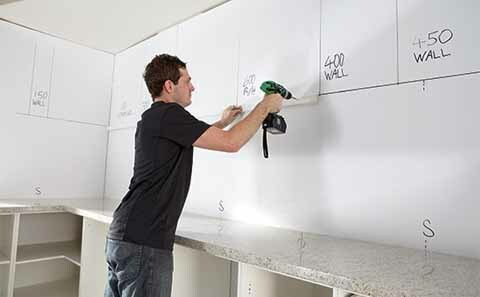 If you have a design where two BENCHTOPS will meet in a corner, we recommend a mason’s mitre-cut joint. As this is a join that requires advanced skill, either take your blanks to a local benchtop company, or have a contractor with the right equipment assist you on-site. Make sure everything is straight before you start fixing them to the cabinets. Screw the benchtops into place. Screw up and through the front and back rail within the base panels (see illustration). 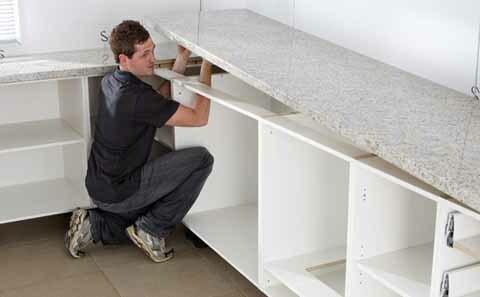 If you have two benchtops meeting at a corner with a mitre-cut join, benchtop connectors can be used to pull the tops together so you can fix them in place with screws. to stop the sink from pulling through the bench, and to hide the cut by allowing the edges of the sink to sit over it. Once you have marked out the cutting space with your template, take a drill with a 10mm bit and make a hole somewhere within the area. From that hole slowly cut out the required shape with a jigsaw. From there it’s just a matter of fitting the sink into place with the supplied brackets and tape, if you need to make any adjustments, do so now. 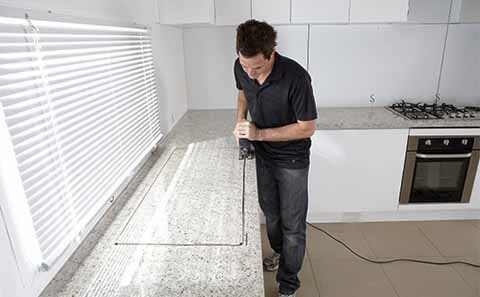 This process will be almost exactly the same as the way you installed the sink, making your cut based on the template or instructions that have been supplied with your cooktop. Take your time when using the jigsaw to ensure an even cut. And that’s your benchtops, sink and cooktop installed. Only the finishing touches to go. Most of the hard work is done as we move to the finishing and fitting steps of the installation process. In this section we detail how to install the kickboards and handles as well as some advice on installing other items including doors. Some of these items will have been supplied with their own instructions, but if you misplace the instructions, or get stuck at any point, contact your local store for advice. Install any accessories before installing the doors and drawer fronts. These could be things like pull out bins, tea towel holders, and soft close fittings for doors and drawers. Door and drawer front installation instructions will have been supplied as a separate document to this one. Refer to them for installation guidelines. While installing doors, leave the protective film on the doors. Remove it after drilling the holes for the handles. the glide) and if necessary, scribe your kickboards to ensure a snug fit. Adjustable feet clips will have been supplied in the hardware packs. Position these in line with the cabinets’ feet and then screw these to the kickboards. Once all the clips are securely fastened, line the kickboard up and press them into place. Handle positioning is largely a personal preference. Some like their handles vertical, whilst others prefer them horizontal. Take your tape measure, and measure from the top of the door or drawer to where you want the first hole. Mark with a horizontal line and then repeat with the second hole. Make sure these markings line up with the exact centre of where the hole needs to be. With your set square mark the measurement from the edge of the door. Run your set square down to your marked handle position and mark with a vertical line to the position of the holes. If done right, the horizontal and vertical marks should intersect at the exact drilling point. Double check your measurements before you begin. Use a small drill bit, only slightly larger than the screws to make the hole, then screw everything into place with a screwdriver. Repeat until all handles are fixed into place. Make any adjustments to the alignment according to the assembly instructions included with your doors and drawers. Congratulations, you’ve installed a brand new Profile kitchen from start to finish. We hope you’re delighted with the result. IMPORTANT - PLEASE READ: All information and tips in this publication are of a general nature only and The Independent Hardware Group does not warrant the accuracy or completeness of the information and tips in this publication. This publication is not intended to be a substitute for expert advice. The Independent Hardware Group advises you to always consult an experienced and qualified person when undertaking jobs of this kind (including consulting a qualified tradesperson such as an electrician or plumber where relevant expert services are required). You should also consider any safety precautions that may be necessary when undertaking the work described in this publication (including wearing any necessary safety equipment such as safety glasses, goggles or ear protectors or hard hats). The information and tips in this publication are provided on the basis that The Independent Hardware Group excludes all liability for any loss or damage which is suffered or incurred (including, but not limited to, indirect and consequential loss or damage and whether or not such loss or damage could have been foreseen) for any personal injury or damage to property whatsoever resulting from the use of the information and tips in this publication. 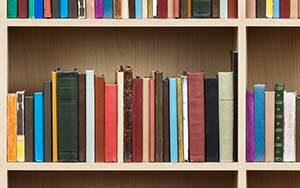 The Independent Hardware Group also notes that there may be laws, regulations or by-laws with which you must comply when undertaking the work described in this publication. You should obtain all necessary permissions and permits from council and/or any other relevant statutory body or authority before carrying out any work. Use a damp cloth when cleaning down surfaces. Only use cleaning products intended for the door, cabinet and benchtop materials. Do not use cleaning agents containing ammonia, alcohol or abrasives. After cleaning, wipe down surfaces with a clean dry cloth.